Portrait of Princess Ka'iulani of Hawaii at 17 as she attended school at the prestigious Great Harrowden Hall in Northamptonshire. Painting by Eric Lon Caldwell, an Hawai'i artist. in such a way that I cannot alter it..."
"...An overlooked heroine of Scottish heritage: Victoria Ka'iulani Cleghorn, Crown Princess of the Kingdom of Hawai'i, daughter of Princess Miriam Likelike (sister of Queen Lili'iuokalani) and Edinburgh Scot Archibald Cleghorn. Learn the intriguing transoceanic tale of the exquisite and gifted "Hope of Hawai'i". Educated in Britain, friend of Robert Louis Stevenson, Ka'iulani would lose her Royal birthright when American interests overthrew the Hawaiian Monarchy in 1893; after four years semi-stranded in Europe (with one trip to America to plead her Nation's cause), the Princess returned to her homeland, to comfort her people and show solidarity with her Aunt the deposed Queen. 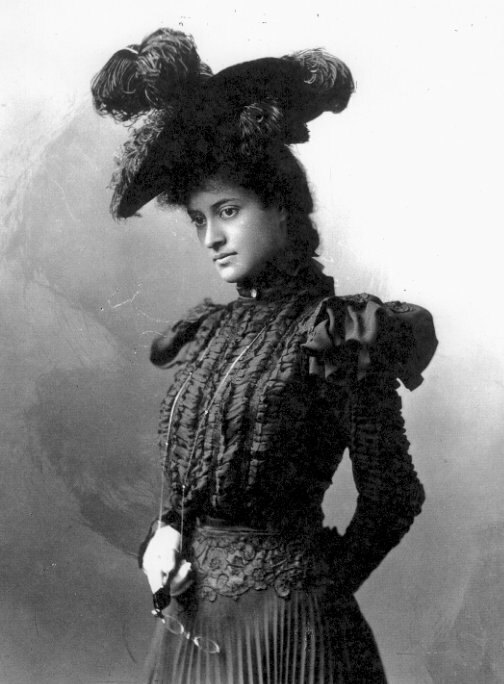 Despite her beauty, talent and courage, sorrow and ill health laid Ka'iulani to untimely rest at age 23 in early1899, shortly after her country's annexation to the United States." 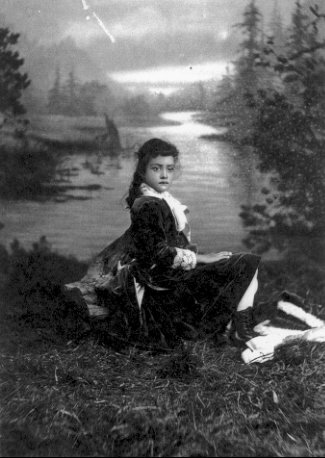 Princess Kaiulani was the daughter of Archibald Scott Cleghorn, a Scotsman. To smile in Kaiulani’s eye." They may not be amongst the best lines ever penned by their writer, but the simple verses inscribed in a red plush autograph book belonging to a schoolgirl have unique significance to two cultures a world away from each other. And they were heartfelt verses: Robert Louis Stevenson, one of Scotland’s most famous literary sons, knew his youthful friend and critic - the half-Scottish, half-Hawaiian Princess Victoria Ka’iulani (whose name translates as "royal sacred one" or "the highest point of heaven") - would soon be entering a strange new world for the sake of her education, the world of her Edinburgh-born father…the British Isles far from the island Kingdom home of her birth. She was born in October of 1875, the daughter of Princess Miriam Kapili Likelike (pronounced "Lee-keh-lee-keh") and Scotsman Archibald Scott Cleghorn, prosperous businessman, horticulturist, and eventual Governor of O’ahu during Queen Lili’uokalani’s reign. Princess Likelike, gifted musician and renowned society hostess, was sister to Hawai'i’s then reigning monarch, the brilliant "renaissance man" and cultural visionary David La’amea Kalakaua; of the "Na Lani ‘Eha" - the four royal siblings comprising the Kalakaua dynasty - Likelike was the only member fated to produce a royal child. 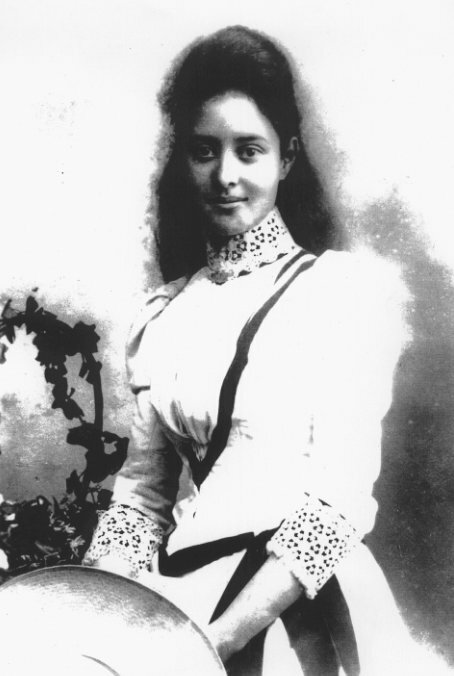 And upon this "hapa-haole" (part-non-Hawaiian) infant would rest the fondest hopes of the Kanaka Maoli people for their Nation and place in the wider world; after her uncle’s untimely death, his also-childless sister Lili’uokalani would name her niece heir to the endangered Hawaiian throne. The childhood idyll that was the Stevenson-Ka’iulani friendship has sadly in recent years been tampered with by some…; although the Princess was barely thirteen when she made her last farewells to the Stevensons before sailing to San Francisco en route for Britain), a new myth has arisen…one postulating a "romance" between the Scottish author and his young royal friend. It should be unnecessary to call this fabrication absurd, considering the Princess’ age and station in life - but those familiar with the details of the historic record of this charming friendship find they must occasionally do so. The brief happiness of visits (barely four month’s-worth) shared between ‘Ainahau (the Cleghorn garden estate) and the Stevenson dwelling further down the beach was of the most innocent nature…a matter of family gatherings or story-telling sessions. Ka’iulani was enthralled with Stevenson’s Celtic talent for giving even simple matters a unique magic: so delighted was she with his tales of the Hawaiian mouse to whom he played a flageolet, that in her child’s notes to him (often dinner invitations: the little Princess tried gamely to fill the shoes of her late mother) she would ask that he "bring his flute!". (On another occasion she announced that her "…Papa promises good Scotch ‘kaukau’ for all you folks." [Note: "Kaukau" as used here by the Princess is not a true Hawaiian word, but rather a vernacular expression meaning something like "eats".] Tea parties under the famed ‘Ainahau banyan, or visits in the little thatch house that had been her mother’s office, were times to talk about the health of her pony "Fairy"…share opinions about various stories (Stevenson loaned books to her, and she remained an avid reader throughout her life)…or laugh at the antics of the beloved pet peacocks. "Island Rose", "Island Flower"…"Pua o Hawai'i" (Hawai'i’s Flower), "Rose of ‘Ainahau". Ka’iulani’s memory has evoked the use of all these floral names…and her mystique is irrevocably linked with one of Hawai'i’s favorite scents…that of the Chinese jasmine. It is still believed the Princess loved these delicate blossoms best of all the flowers planted in the grounds of her home estate. And quite literally "…her name has left the fragrance of a flower," (the words of poet Ella Wheeler Wilcox) for to this day the jasmine is called by the Hawaiianized word for "peacock… "pikake"…in tribute to the Princess’ attachment to both jasmine and her elegant avian pets. Even graphics for one version of the seal of the Caledonian Society of Hawai'i - whose web-pages proudly include a tribute to the Princess - contains the multi-stranded pikake-blossom lei as a reference to the importance of the "Rose of ‘Ainahau" in both Hawai'i’s indigenous and Scottish heritage. No-one gives or receives this most cherished lei without remembering Ka’iulani. Aside from a portrait by famed New Zealand artist Kristin Zambucka displayed on the premises of the Wellingborough Golf Club in Northamptonshire (formerly "Great Harrowden Hall", seat of the Barons Vaux, and site of Ka’iulani’s finishing school days), and a replica of her surfboard in the collection of the British Surfing Museum, no public tribute to her memory is known to exist in the British Isles…though she spent time in England, Scotland, Wales and Ireland as well. It is to be hoped that - with the ongoing revival of rich Kanaka Maoli cultural traditions, and the increasing availability of the historical truth in regards to the fate of the Hawaiian Kingdom - Ka’iulani shall assume her place as not only a heroine of the Hawaiian people, but of her Celtic kinspeople a world away. Ka’iulani was devastated when her British guardian - and "second father" - Theophilus Davies found himself forced to read her the terrible cables breaking the news of the Monarchy’s fall. A handful of white renegade businessmen unwilling to see their interests curtailed by the laws of the Kingdom, conspired and succeeded in forcing Ka’iulani’s beloved Aunt from her throne, with assistance from representatives of the American military (a gunboat with weaponry trained on the Royal Palace, and U.S. Marines landed to supposedly "protect the property" of Americans). A campaign of racist propaganda, and toadying to the disciples of "Manifest Destiny" in Washington, D.C., kept matters in foment until "lame duck" President Cleveland was safely out of office, and the pro-annexation McKinley in his place. "Seventy years ago Christian America sent over Christian men and women to give religion and civilization to Hawai'i. Today, three of the sons of those missionaries are at your capitol asking you to undo their father’s work. Who sent them? Who gave them the authority to break the Constitution which they swore they would uphold? Today, I, a poor weak girl with not one of my people with me and all these ‘Hawaiian’ statesmen against me, have strength to stand up for the rights of my people. Even now I can hear their wail in my heart and it gives me strength and courage and I am strong - strong in the faith of God, strong in the knowledge that I am right, strong in the strength of seventy million people who in this free land will hear my cry and will refuse to let their flag cover dishonor to mine!" The "heathen Princess", the clownish "Princess Koylani" of pro-annexation skits and cartoons, the backward "savage" anti-Monarchy propaganda-merchants tried to paint her as, proved quite a surprise as she traveled across the United States following her education; instead of the caricature cannibal expected, the paparazzi of the day were confronted by an exquisite Royal Princess wearing the latest Paris gowns and speaking cultured English (or ’Olelo Hawai’i, French and German, if the occasion demanded). 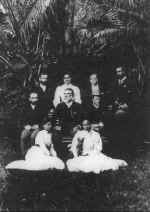 The continual attempts to present all those of Kanaka Maoli heritage as illiterate "children" incapable of ruling themselves backfired whenever the Hawaiian-Scottish Princess arrived upon the scene. (As a San Francisco Examiner reporter would snort reprovingly in print, "A barbarian princess? Not a bit of it. Not even a hemi-semi-demi-barbarian. Rather the very flower - an exotic - of civilization. The Princess Kaiulani is charming, fascinating, individual." And yet another reporter would note, "She is beautiful…there is no portrait that does justice to her expressive, small, proud face. She…holds herself like a Princess, like a Hawaiian - and I know of no simile more descriptive of grace than this last…Her accent says London, her figure says New York…but her heart says Hawai'i.") She had spoken for her people with authority, as her Ali’i (royal) calling demanded, and her loyalty to her aunt and Queen never wavered. 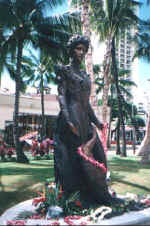 Had it not been for a few cruel tricks of historical fate (such as the outbreak of the Spanish-American war and the coming to power of an American President devoted to the idea of "Manifest Destiny"), Princess Ka’iulani might have turned the tide and truly saved her nation, as Ellen Wright Prendergast credited her with in a honoring song; as it was, many a guilty American conscience must later have endured uncomfortable memories of the noble and courageous Princess, and the truth she represented. 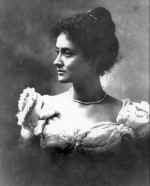 Though her efforts in Washington, D.C. failed, the Princess – as late historian Glen Grant noted – continued to work in her Nation’s interest once home, giving one notable lu’au to annexation commissioners…during which the she made certain Hawaiian community leaders could present the anti-annexation petitions their political societies had compiled. She was only 23 when she died…finally at home in Hawai'i, but health broken by a life-time of losses - of her governess, god-mother, mother, uncle, beloved half-sister, guardian, and country. 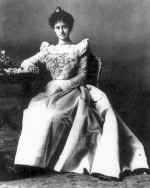 At two a.m. on the morning of March 6th, 1899, the peacocks dwelling in the 10-acre grounds of her magnificent home estate ‘Ainahau ("land of hau trees" or "cool place") abruptly began to scream…a terrible din which alerted all of Honolulu to the fact that the brave half-Scottish Princess who had traveled so far, seen so much, and made such gallant efforts to save her Hawaiian nation had only returned home to defeat, ill health (it is likely she suffered from thyroid disease), and death. To this day, legend has it that the cherished pets of "The Princess of the Peacocks" knew the spirit of their mistress had fled…some of them becoming so inconsolably raucous as a result that the Princess’ stricken father had to have them shot. Even her political enemies (who had sneered at her as the “British Princess”, or insultingly suggested the “ex-Princess” could open a jewelry shop!) expressed their grief at her unexpected passing: "It was impossible not to love her," acknowledged the American-controlled Honolulu press. Despite the continued noble efforts of her aunt the Queen and loyal Royalists to bring America to account for the overthrow of the rightful Hawaiian government (and subsequent illegal annexation of the island nation), with the death of their beloved Crown Princess, many Hawaiians felt that hope for restoration of their Nation during their life-times was at an end. But the influence of the short life of this queenly young woman continues to this very day…inspiring people of many walks of life and differing backgrounds to various achievements in her honor. Two communities (and many individuals with ancestral ties to both) take great pride in her, and justly so. Today Ka’iulani’s fascinating duality and unbowed Hawaiian spirit inspires artists, musicians, poets and dramatists to creative attempts to evoke its essence, and explore the Princess’ significance to the complicated modern Hawaiian political and cultural scene. The renowned musical duo "HAPA" (whose name reflects the respective Kanaka Maoli/Caucasian ethnic origins of the musicians) have produced one of the loveliest of all the innumerable songs that have been composed in Ka’iulani’s honor since her birth: "Nani Wale o Ka’iulani"… a song perpetuating a 19th century Hawaiian form in which English and ‘Olelo Hawai'i (Hawaiian language) lyrics are mixed together. (Their "In the Name of Love" CD’s cover art features the two original artists dramatically juxtaposed, as same-yet-different cultural/spiritual "warriors", armed with guitars…Keli’i Kaneali’i barefoot, batik fabric around his hips, Barry Flannagan in boots and kilt.) "Our love for you forever will remain…; Nani wale o Ka’iulani, There’s beauty in the sound of your name. Kou aloha mau loa e Ka’iulani…Our love for you forever will remain… Precious flower in the misty rain…"
New books about or including references to the Princess’ life continue to appear, and old ones have been revised or reprinted; the Princess’ tragic story has inspired Russian poetry, and even a major work of science-fiction. Her own words in defense of her country have been rediscovered and now serve as inspiration to a new generation exploring means to insure cultural survival and the correction of wrongs done a sovereign nation. Paintings depicting the cherished Scottish-Hawaiian princess are everywhere in the Islands…found in schools, hotels, museums and even dress-shops (a famous fashion-line is named for her); a mural of Ka’iulani and Stevenson discussing Scotland under the ‘Ainahau banyan (by artist and Ka’iulani admirer Niki Fuller) graces a wall in Honolulu’s St. Francis Hospice. The Princess has been immortalized in everything from a life-sized wax figure to delicate porcelain statuettes; china plates, music boxes, champagne flutes, diamond-studded cameo brooches, and commemorative coins have carried her image. And while nothing remains of the 10-acre botanical wonderland that Archibald Cleghorn (known as Hawai'i’s "Father of Parks") labored long years to perfect (his gift of it to the new "Territory" of Hawai'i - in hopes it would remain a perpetual park to his daughter’s memory - was rejected)…signs of the rebirth of a "spirit of place" are beginning to appear in overbuilt Waikiki: in October of 1999 a heroic-sized statue of Ka’iulani feeding one of her peacocks made its debut on a small revitalized parcel of the old ‘Ainahau property, to henceforth educate visitors and residents alike about the Princess’ life. Perhaps the most intriguing and complex artistic homage paid to the Crown Princess in modern times was that of "Ka’iulani: A Cantata for the Theatre"…a production of Honolulu’s prestigious multicultural theatre company, Kumu Kahua. In this highly innovative and politically uncompromising modern play, the Princess is portrayed at one point by two actors simultaneously…a woman of European ancestry, and a woman of Kanaka Maoli. Having met with enthusiasm during its Honolulu, Los Angeles and Washington, D.C. performances, the production traveled on to participate in the Edinburgh Fringe Festival, where its theme of submerged nationhood impressed and moved the Scottish audience…who perhaps found it easy to identify with both sides of the Princess’ heritage…a resonance of historic injustices, and yet unresolved political futures. Despite its surface aura of tragedy, of promise cut short, Princess Ka’iulani’s "story" is by no means one of failure or defeat…nor is it ended. While most of her biographers close with that sad day on which the Princess was laid to rest in the quiet of the Royal crypt at Mauna ‘Ala, the tale of a subsequent century of Ka’iulani’s influence needs to be told. 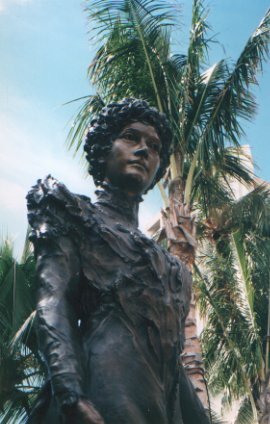 Although justice for her beloved people has long been deferred, a sense of her spiritual inspiration is ever-increasing…both home in Hawai'i and in the larger world: from the achievements of students at the impoverished but academically excellent school named for her, to the installation of the heroic-sized statue in Waikiki, Princess Ka’iulani’s name is gaining wider and wider recognition. The need for a superb, Hawaiian-culture rooted historical documentary on the Princess’ life – something along the lines of a Ken Burn’s documentary, drawing on the great wealth of historic materials that exist, including the extensive Hawaiian language press of Ka’iulani’s day – is under increasing discussion by artists, cultural practitioners, educators and activists in Hawai’i. "…ke kakelo o Dreghorn. Ia lakou i noho ai i laila, ua kowelo ha’aheo ka hae Hawai'i ma ka ‘ale’o o ua hale la. Kaulana keia hale, no ka mea ua kipa mai ka mo’i o Kalakaua i keia hale ho’okahi, a i kona noho ‘ana, ua kono ‘ia’o ia e kanu i kekahi kumu la’au ma Dreghorn. No laila, ua kanu ‘o ia i ’elua kumu la’ua, a i ko Ka’iulani hele ‘ana i laila, ua kono ‘ia’o ua kekahi e kanu i kumu la’au…"
…which describes how Ali’i (royalty) were entertained at Dreghorn Castle (from whose tower the Hawaiian flag was flown in celebration), and invited to plant some very special trees. Whether or not the tree Ka’iulani planted in Scotland survives, the spirit of the Scottish-Hawaiian Rose will live forever. Mindi Reid is a writer currently living in the Puget Sound region. I've recently come across this very Victorian but quite remarkably strong poem by Australia's noted poet, Agnes Rose-Soley. She was actually born in Scotland...another Ka'iulani/Scotland connection. “Our Flag! That was pulled down. The Hawaiian Ladies’ Patriotic Society wrote to Admiral Miller, asking to be allowed its possession. He never answered. My own flag, the Royal Standard, was shown to me by a Washington young lady in her drawing room.” -Ex Queen Liliuokalani. “I have nothing to live for now. They have taken all my life from me.” – Princess Ka’iulani. Kaiulani! Kaiulani! sighs the scented tropic breeze. Kaiulani! dove-notes echo through palm fronds and darkling trees. And the burden of its sadness over reef and ocean flees. That royal kahili still meets the eye? That all Hawaii’s treasures are your meed? Even in Death’s sad sleep despoiled be? Have ye no pity, are your hearts of stone? Can’st thou hear the sound of weeping, rising thro’ they palm-crowned aisles? Can’st thou hear the sound of weeping, rising thro’ thy palm-crowned aisles? 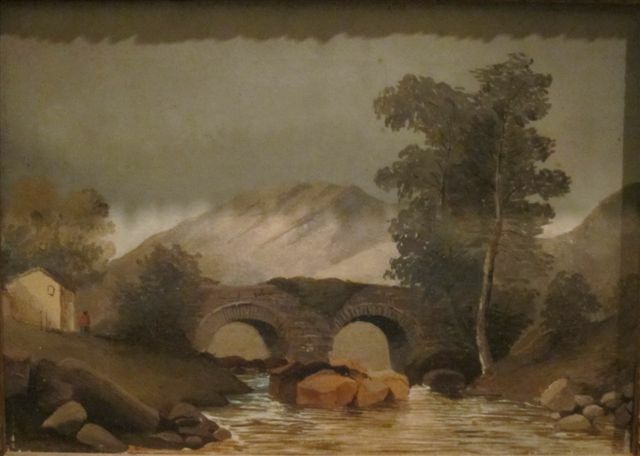 In the collections of Bernice Pauahi Bishop Museum, there is a painting Ka'iulani did in about 1891 or so, of what has always been called a "Scottish landscape". I've seen it on display myself (and I was the person who paid YEARS ago for Bishop to have it photographed). The image has been published on the back of the book about bagpipes in the Hawaiian islands. In all this time, it hadn't occurred to me that perhaps the greater Scottish community might be able to identify the landscape. Please email us if you can identify the scene.